My mother and I had a deeply moving conversation the day after I returned home to care for her as she was dying. Sitting in the sunroom, alone for the first time since I arrived, we acknowledged what lay just ahead. We shared our abundant love for one another, and our tears flowed with equal abundance. As this sacred conversation continued, she apologized for failing to nurture a religious life in me, feeling, I believe, a lack of her own spiritual grounding in this most painful season of her life. I know, too, that she could see things about me that I could not, and she sensed in me a desire for a faith I did not feel. I wish she had known on that bleak winter day, as I do today, that her spirit would one day guide me to the faith for which I yearned. The National Cathedral was relatively empty on the morning some 14 years later when I went to one of the chapels to mark the anniversary of her death with reflection and silence. I lit a candle and sat alone among the rows of chairs. I had been an occasional visitor to the Cathedral in previous years, but I’d never attended a regular service or even opened the Book of Common Prayer. In search of comfort that day, I read sections of the BCP devoted to funerals and burials. One prayer drew me back over and over again: “Father of all, we pray to you for those we love, but see no longer: Grant them your peace; let light perpetual shine upon them.” I imagined that light shining on my mother, shining on all of my departed loved ones. I felt its warmth. What more could I want for her, for them – for me. Her spirit was present to me that day in a way that I have only experienced a few times since she died. I soon became a regular attendee at Sunday services. Within a few months I was confirmed as an Episcopalian in the Cathedral nave and within the year I was participating regularly in services as a volunteer. My faith journey is about to take another step, a step I would never have imagined during that conversation with my mother or the morning so many years later in the Cathedral. Soon I will leave my job – and 30 years in service primarily to the cause of expanding and delivering care and treatment to people living with HIV– to become a full-time verger at the Cathedral and help nurture and sustain a holy place of welcome, healing, and prayer in a broken world. It is not a decision I made lightly, but it is one I made easily. There is sadness in the loss of a personal mission I carried for so long. Yet, I do not feel like I am walking away. I feel as though I am walking with. Walking with the spirits of those I have loved and struggled alongside into a space where I can celebrate God’s Grace among us with joy and thanksgiving. 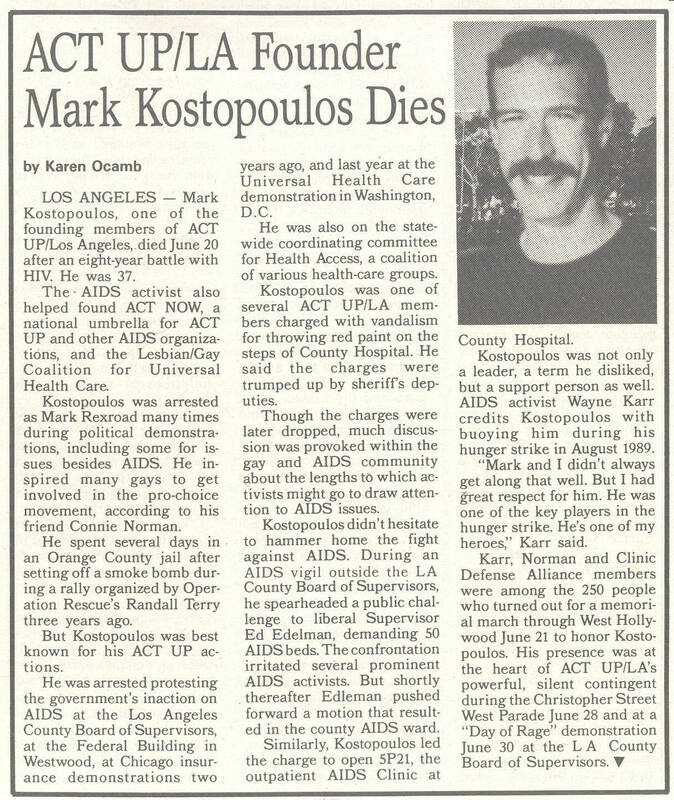 My beloved friend Mark was one of the fiercest and most committed street activists of the early ACT UP days. Sensing that time was of the essence, Mark wanted to travel as much as possible, and he asked me to join him on several adventures. One afternoon, as we sat having a picnic in the Spanish countryside, his shirt off to soak up the winter sun, his back and lungs filled with Kaposi’s Sarcoma lesions, he looked at me and said “make sure you have more moments like this in your life. In the end, that’s what really matters.” Mark died four months later at the age of 37. Mark’s been gone for over 25 years. Much as my heart broke then, it breaks today for what I see every day at Joseph’s House. Poverty and racism are still killing people with HIV. Most of those who die here are young, African American, and very afraid. The care system in this city is failing the most vulnerable, as it is in so many places. In my five years of daily life among this community, layers of trauma and racism in our society and their devastating impacts have continued to reveal themselves in ways that leave me feeling naïve and, at times, bordering on hopelessness. I vow not to turn away from these hard truths, but to engage them in a different way. When I came out as a gay man to my mother, she ended our time together by saying, “I just want you to be happy.” I felt that too in Mark’s words to me. Not “smiling happy,” but a deeper contentment. Others who love me now speak the same wish: Go into the world and know joy. As I contemplated the possibility of taking this position, my life’s journey made sense to me in a way it never had before. For the past few years I have been comforted by words from one of my favorite sermons, “All the time that you were searching for God, God was searching for you.” I see it differently now. Today I believe that all the time I was searching for God, God was with me, unfolding a journey that I could not imagine or understand. Without the sorrows and struggles, the gifts and delights, I would not appreciate the beauty I see today; I would not be so grateful for the love that has and continues to fill my life. With God’s Grace, let it be so. Beautifully said Scott! May God continue to bless you and use you as I know He will! This is beautiful, Scott. I’m so happy for you. Thank you Scott for these heartfelt memories shared and for heeding the words of contemporary mystics like your mother and Mark and Frederick Buechner. All their words ring in my heart as you share them. I pray your new job and growth on your continuing spiritual path brings you sustained joy…indeed, may it be so!!! Beautifully written Scott. Thank you for your past work and the work that you will continue to do. Prayers as you move forward on your journey. So grateful for you in so many ways. Thank you for sharing your journey as you prepare to make this transition. You will be greatly missed at Joseph’s House and greatly appreciated at the Cathedral. May you continue to live in Love and Light.